Evergreen-Maritime is world leader in the design and manufacture of Ship Launching System, Marine Fendering System, Offshore Buoyancy System. Herein, Evergreen-Maritime Marine Fendering SystemsTM aim at providing High-Performance marine fenders system for Ship-to-Ship and Ship-to-Port operation, including Fixed Dock Fenders, Pneumatic Rubber Fenders, Foam Filled Marine Fenders, Tugboat Fenders. Pneumatic Rubber Fenders are approved comply with ISO17357:2002 by Lloyd's. 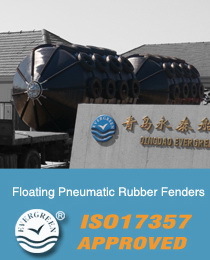 Marine Rubber Fenders are manufactured as per PIANC stardand.